Yes, of course Christmas Day is about family, presents, lots of food and relaxing. But at Outside Concepts we reckon there’s one other vital ingredient – the outdoors! For us – and millions of other Aussies – there’s no better way to enjoy Christmas Day than getting outside into your outdoor living area. So if you live in Canberra, what better way to spend Christmas Day than in your Canberra outdoor living area. If you’ve got friends and family coming around for Christmas Day, purchasing new outdoor furniture might be a good idea. However, if you don’t have large gatherings regularly, why not bring some of your inside furniture outside? It’s a convenient way to tackle those special occasions. 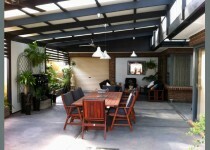 Give your Canberra outside living area a good tidy up. Sweep the deck, clean the furniture and the BBQ, and remove any cobwebs and dust from walls, fences and ceilings. Don’t forget the surrounding garden area. Mow the lawn, weed the garden and give the whole area a good water so it will be looking its best. Consider going to the local nursery to purchase some plants that are in flower. Pots of potted colour can be dirt cheap and combined with decorative pots will really brighten up your outdoor living area. To brighten up your Canberra outdoor living area, don’t forget the Christmas decorations. 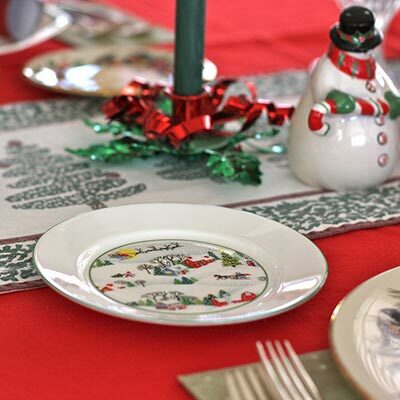 Christmas tablecloths, serviettes, bon-bons, baubles and candles will get everyone into the spirit of the day. Spend your time outside with your family and friends rather than inside cooking. There are so many delicacies that can be cooked on a decent BBQ and salads and desserts can be prepared earlier, in some cases even the day before. Most of all, enjoy your Christmas Day in your Canberra outdoor living area. Merry Christmas from all the team at Outside Concepts. Looking for a solution to your outdoor lifestyle this Christmas? Call us now for a free quote on 1800 601 674.